Many songs from the swing era were inspired by melodies from other genres. Bizet Has His Day has its origin in classical music and how the title tells us, a piece by the composer Georges Bizet. Basis is “Farandole” from L'Arlésienne-Suite. The swing version was adapted and arranged by Ben Homer. 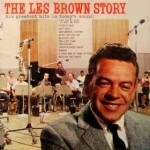 In 1940 he became a staff composer for band leader Les Brown (14.03.1912-04.01.2001). The latter led a first-class jazz-oriented dance band for over 60 years. Of course it's not innovative to take an existing melody, but Bizet Has His Day is for sure a successful transformation into a great danceable swing tune! In addition, the tempo is very comfortable for Lindy Hop dancers. *not an eMusic member yet? Get 25 Songs with Your 7 Day FREE Trial! Do you like this song? Do you like the series? Please leave a comment! Sign up now for DJ Chrisbe's free resources emails for more music tips and swing DJ resources!